Indicate by check mark if disclosure of delinquent filers pursuant to Item 405 of Regulation S-K is not contained herein, and will not be contained, to the best of registrant’s knowledge, in definitive proxy or information statements incorporated by reference in part III of this Form 10-K or any amendment to this Form 10-K. ☐. * Based on reported ownership by all directors and executive officers at June 30, 2016. These factors are not necessarily all of the important factors that could cause our actual financial results, performance, achievements or prospects to differ materially from those expressed in or implied by any of our forward-looking statements. Other unknown or unpredictable factors also could harm our results. All forward-looking statements attributable to us or persons acting on our behalf are expressly qualified in their entirety by the cautionary statements set forth above. Forward-looking statements speak only as of the date they are made, and we do not undertake or assume any obligation to update publicly any of these forward-looking statements to reflect actual results, new information or future events, changes in assumptions or changes in other factors affecting forward-looking statements, except to the extent required by applicable laws. If we update one or more forward-looking statements, no inference should be drawn that we will make additional updates with respect to those or other forward-looking statements. The “Company,” “we,” “our” or “us” means Stepan Company and one or more of its subsidiaries only. Stepan Company, which was incorporated under the laws of the state of Delaware on February 19, 1959, and its subsidiaries produce specialty and intermediate chemicals, which are sold to other manufacturers and used in a variety of end products. The Company has three reportable segments: Surfactants, Polymers and Specialty Products. Surfactants are chemical agents that affect the interaction between two surfaces; they can provide actions such as detergency (i.e., the ability of water to remove soil from another surface), wetting and foaming, dispersing, emulsification (aiding two dissimilar liquids to mix), demulsification, viscosity modifications and biocidal disinfectants. Surfactants are the basic cleaning agent in detergents for washing clothes, dishes, carpets, fine fabrics, floors and walls. Surfactants are also used for the same purpose in shampoos, body wash and conditioners, fabric softeners, toothpastes, cosmetics and other personal care products. Commercial and industrial applications include emulsifiers for agricultural products, emulsion polymers such as floor polishes and latex foams and coatings, wetting and foaming agents for wallboard manufacturing and surfactants for enhanced oil recovery. In 2016, the Company’s subsidiary in Brazil purchased the commercial business of Tebras Tensoativos do Brazil Ltda. (Tebras) and the sulfonation production facility of PBC Industria Quimica Ltda. (PBC). The acquisition is expected to expand and diversify the Company’s customer base for sulfonated products in Brazil and to provide an opportunity to sell the Company’s broader surfactants portfolio to over 1,200 new customers who management believes will benefit from the Company’s technical service and formulation support. Polymers, which include polyurethane polyols, polyester resins and phthalic anhydride, are used in a variety of applications. Polyurethane polyols are used in the manufacture of rigid foam for thermal insulation in the construction industry. They are also a raw material base for coatings, adhesives, sealants and elastomers (CASE) applications. Polyester resins, which include liquid and powdered products, are used in CASE and polyurethane systems house applications. Phthalic anhydride is used in polyester resins, alkyd resins, and plasticizers for applications in construction materials and components of automotive, boating, and other consumer products and internally in the Company’s polyols. Specialty Products are chemicals used in food, flavoring, nutritional supplement and pharmaceutical applications. Principal customers for surfactants are manufacturers of detergents, shampoos, body wash, fabric softeners, toothpastes and cosmetics. In addition, surfactants are sold to the producers of agricultural herbicides and insecticides and lubricating products. Surfactants are also sold into the enhanced oil recovery end markets. Polymers are used in the construction and appliance industries, as well as in applications for the coatings, adhesives, sealants and elastomers industries. Phthalic anhydride, a Polymer product, is also used by automotive, boating and other consumer product companies. Specialty products are used primarily by food, nutritional supplement and pharmaceutical manufacturers. The Company does not sell directly to the retail market, but sells to a wide range of manufacturers in many industries and has many competitors. The principal methods of competition are product performance, price, technical assistance and adaptability to the specific needs of individual customers. These factors allow the Company to compete on bases other than price alone, reducing the severity of competition as experienced in the sales of commodity chemicals having identical performance characteristics. The Company is one of the leading merchant producers of surfactants in the world. In the case of surfactants, much of the Company’s competition comes from several large global and regional producers and the internal divisions of larger customers. In the manufacture of polymers, the Company competes with the chemical divisions of several large companies, as well as with other small specialty chemical manufacturers. In specialty products, the Company competes with several large firms plus numerous small companies. The Company did not have any one customer whose business represented more than 10 percent of the Company’s consolidated revenue in 2016, 2015 or 2014. The Company has contract arrangements with certain customers, but volumes are generally contingent on purchaser requirements. Much of the Company’s business is essentially on a “spot delivery basis” and does not involve a significant backlog. plant shutdowns or adverse effects upon its business in recent years that were caused by a lack of available energy sources, other than temporary service interruptions brought on by mechanical failure. The principal raw materials used by the Company are petroleum or plant based. For 2017, the Company has contracts with suppliers that cover the majority of its forecasted requirements for major raw materials and is not substantially dependent upon any one supplier. The Company maintains an active research and development program to assist in the discovery and commercialization of new knowledge with the intent that such efforts will be useful in developing a new product or in bringing about a significant improvement to an existing product or process. Total expenses for research and development during 2016, 2015 and 2014 were $34.9 million, $30.3 million, and $27.2 million, respectively. The remainder of research, development and technical service expenses reflected in the consolidated statements of income relates to technical services, which include routine product testing, analytical methods development and sales support service. Compliance with applicable country, state and local regulations regarding the discharge of materials into the environment, or otherwise relating to the protection of the environment, resulted in capital expenditures by the Company of approximately $1.7 million during 2016. These expenditures represented approximately 2 percent of the Company’s total 2016 capital expenditures. Capitalized environmental expenditures are depreciated and charged on a straight-line basis to pretax earnings over their estimated useful lives, which are typically 10 years. Recurring costs associated with the operation and maintenance of facilities for waste treatment and disposal and managing environmental compliance in ongoing operations at our manufacturing locations were approximately $25.0 million in 2016. Compliance with such regulations is not expected to have a material adverse effect on the Company’s earnings and competitive position in the foreseeable future. At December 31, 2016 and 2015, the Company employed 2,145 and 2,073 persons, respectively. The Company has collective bargaining agreements with employees at some of its manufacturing locations. While the Company has experienced occasional work stoppages as a result of the collective bargaining process and may experience some work stoppages in the future, management believes that it will be able to negotiate all labor agreements on satisfactory terms. Past work stoppages have not had a significant impact on the Company’s operating results. Overall, the Company believes it has good relationships with its employees. See Note 17, Segment Reporting, of the Consolidated Financial Statements (Item 8 of this Form 10-K). See Note 20, Acquisitions, of the Consolidated Financial Statements (Item 8 of this Form 10-K). See also Note 21, Sale of Product Line, of the Consolidated Financial Statements (Item 8 of this Form 10-K). The Company’s website address is www.stepan.com. The Company makes available free of charge on or through its website its code of conduct, annual report on Form 10-K, quarterly reports on Form 10-Q, current reports on Form 8-K, and all amendments to those reports as soon as reasonably practicable after such material is electronically filed with or furnished to the Securities and Exchange Commission. The website also includes the Company’s corporate governance guidelines and the charters for the audit, nominating and corporate governance and compensation and development committees of the Board of Directors. The Company’s executive officers are elected annually by the Board of Directors at the first meeting following the Annual Meeting of Stockholders to serve through the next annual meeting of the Board and until their respective successors are duly elected and qualified. F. Quinn Stepan, Jr. assumed the position of Chairman of the Company’s Board of Directors on of January 1, 2017. He continues to serve the Company as President and Chief Executive Officer, as he has done since January 2006. He served the Company as President and Chief Operating Officer from 1999 through 2005. From January 1997 until February 1999 he served as Vice President and General Manager – Surfactants. From May 1996 until January 1997 he served as Vice President – Global Laundry and Cleaning Products. From May 1992 until May 1996 he served as Director – Business Management. Frank Pacholec has served the Company as Vice President, Strategy and Corporate Development since June 2016. He served as Vice President, Research and Development and Corporate Sustainability Officer from May 2010 until June 2016. From April 2003 until May 2010 he served as Vice President, Research and Development. Gregory Servatius has served the Company as Vice President, Human Resources since February 2006. From April 2003 until January 2006, he served as Vice President, Surfactant Sales. From October 2001 until April 2003, he served as Vice President Functional Products. From 1998 to 2001, he served as the Managing Director of the Company’s European operations. Scott C. Mason has served the Company as Vice President, Supply Chain since March 2010. From January 2006 until December 2009, he served as Senior Vice President Global Supply Chain and President, Alternative Channels of Nalco Company. Scott D. Beamer has served the Company as Vice President and Chief Financial Officer since August 2013. From January 2012 until July 2013, he served as Assistant Corporate Controller at PPG Industries, Inc. From June 2008 until December 2011 he served as Chief Financial Officer and Director of Finance – PPG Europe at PPG Industries, Inc.
Arthur W. Mergner has served the Company as Vice President and General Manager – Polymers since April 2014. From June 2013 until April 2014, he served as Vice President – North America Polymers. From July 2008 through June 2013 he served as Vice President, Procurement. Scott R. Behrens has served the Company as Vice President and General Manager – Surfactants since September 2014. From January 2010 to September 2014 he served as Vice President – Business Management. From November 2008 to January 2010 he served as Vice President – Functional Products. Debra A. Stefaniak has served the Company as Vice President, Business Transformation since February 2014. From May 2009 to February 2014, she served as Vice President, Global Logistics. From July 2006 to May 2009, she served as Director, Global Logistics. Jennifer A. Hale has served the Company as Vice President, General Counsel and Secretary since January 2016. From 2013 through 2015, she served as Vice President, Global General Counsel and Strategic Business Consultant at Vita-Mix Holdings Company. From 2007 to 2013, she served as Vice President, General Counsel and Secretary at Dyson, Inc.
Robert V. Slone has served the Company as Vice President, Chief Technology and Sustainability Officer since June 2016. From November 2013 until June 2016, he served as Vice President of Surfactants Product Development. From 2011 to 2013, he served as Director of Technology at British Petroleum/Castrol innoVentures. From 2009 to 2011, he served as R&D Director – Formulations and Materials Science at Dow Chemical. The following discussion identifies the most significant factors that may materially and adversely affect the Company’s business, financial condition, results of operations and cash flows. These and other factors, many of which are beyond the Company’s control, may cause future results of operations to differ materially from past results or those results currently expected or desired. The following information should be read in conjunction with Part II, Item 7, Management’s Discussion and Analysis of Financial Condition and Results of Operations and the consolidated financial statements and related notes included in this Form 10-K.
Disruptions in production or accidents at, or loss of, any of our manufacturing facilities may have a material impact on our business, financial position, results of operations and cash flows. Manufacturing facilities in the Company’s industry are subject to planned and unplanned production shutdowns, turnarounds and outages. Unplanned production disruptions may occur for external reasons, such as natural disasters, weather, disease, strikes, transportation interruption, government regulation, political unrest or terrorism, or internal reasons, such as fire, unplanned maintenance or other manufacturing problems. Certain of our production facilities are, and production facilities acquired or built in the future may be, located in areas where unplanned disruptions are more likely. Alternative facilities with sufficient capacity may not be available, may cost substantially more or may take a significant amount of time to increase production or qualify with Company customers, each of which could negatively impact the Company’s business, financial position, results of operations and cash flows. Further, some of the Company’s products cannot currently be made, or made in the volume required, at more than one of the Company’s locations. For some of these products, the Company has access to external market suppliers, but the Company cannot guarantee that these products will be available to it in amounts sufficient to meet its requirements or at a cost that is competitive with the Company’s cost of manufacturing these products. Long-term production disruptions may cause Company customers to seek alternative supply, which could further adversely affect Company profitability. Although the Company takes precautions to enhance the safety of its operations and minimize the risk of disruptions, the Company’s operations are subject to hazards inherent in the manufacturing of chemical products. These hazards include: chemical spills, pipeline leaks and ruptures, storage tank leaks, discharges or releases of toxic or hazardous substances or gases and other hazards incident to the manufacturing, processing, handling, transportation and storage of dangerous chemicals. Many potential hazards can cause bodily injury and loss of life, severe damage to or destruction of property and equipment and environmental damage, and may result in suspension of operations and the imposition of civil or criminal penalties and liabilities. Furthermore, the Company is subject to present and future claims with respect to workplace exposure, exposure of contractors on Company premises as well as other persons located nearby, workers' compensation and other matters. The Company maintains property, business interruption, products liability and casualty insurance policies which we believe are in accordance with customary industry practices, as well as insurance policies covering other types of risks, including pollution legal liability insurance. However, some of these potential manufacturing hazards and risks may not be insurable, and when they are insurable, there can be no assurance that the insurance coverage would be sufficient to cover any or all losses resulting from the occurrence of any of these events or that insurance carriers would not deny coverage for these losses even if they are insured. Each of these insurance policies is subject to customary exclusions, deductibles and coverage limits, in accordance with industry standards and practices. As a result of market conditions, premiums and deductibles for certain insurance policies can increase substantially and, in some instances, certain insurance may become unavailable or available only for reduced amounts of coverage. There is also a risk, beyond the reasonable control of the Company, that an insurance carrier may not have the financial resources to cover an insurable loss. As a result, the occurrence of any of these events could have a material adverse effect on the Company’s business, financial position, results of operations and cash flows. The Company faces significant global competition in each of its operating segments. If the Company cannot successfully compete in the marketplace, its business, financial position, results of operations and cash flows may be materially and adversely affected. The Company faces significant competition from numerous global companies as well as national, regional and local companies in the markets it serves. Many of the Company’s competitors have access to greater financial resources, which may enable them to invest significant capital into their businesses, including expenditures for research and development. Some of the Company’s competitors have their own raw material resources and may be able to produce products more economically. In addition, some of the Company’s customers have internal manufacturing capabilities that allow them to achieve make-versus-buy economics, which may result at times in the Company gaining or losing business with these customers in volumes that could adversely affect its profitability. To achieve expected profitability levels, the Company must, among other things, maintain the service levels, product quality and performance and competitive pricing necessary to retain existing customers and attract new customers. The Company’s inability to do so could place it at a competitive disadvantage relative to its competitors and if the Company cannot successfully compete in the marketplace, its business, financial position, results of operations and cash flows may be materially and adversely affected. The volatility of raw material, natural gas and electricity costs as well as any disruption in their supply may result in increased costs and materially and adversely affect the Company’s business, financial position, results of operations and cash flows. The costs of raw materials, natural gas and electricity represent a substantial portion of the Company’s operating costs. The principal raw materials used in the Company’s products are petroleum-based or plant-based. Natural gas is used in the Company’s manufacturing sites primarily to generate steam for its manufacturing processes. The prices of many of these raw materials have recently increased and been very volatile. These fluctuations in prices may be affected by supply and demand factors, such as general economic conditions, manufacturers’ ability to meet demand, restrictions on the transport of raw material (some of which may be viewed as hazardous), currency exchange rates, political instability or terrorist attacks, all of which are beyond the Company’s control. The Company may not be able to pass increased raw material or energy costs on to customers through increases in product prices as a result of arrangements the Company has with certain customers and competitive pressures in the market. If the Company is unable to minimize the effects of increased raw material and energy costs or pass such increased costs on to customers, or manage any interruption to the supply of raw materials or energy, its business, financial position, results of operations and cash flows may be materially and adversely affected. The Company relies heavily on third party transportation to deliver raw materials to Company manufacturing facilities and ship products to Company customers. Disruptions in transportation or significant changes in transportation costs could affect the Company’s business, financial position, results of operations and cash flows. The Company relies heavily on railroads, barges and other over-the-road shipping methods to transport raw materials to its manufacturing facilities and to ship finished product to customers. Transport operations are exposed to various risks, such as extreme weather conditions, natural disasters, work stoppages and operating hazards, as well as interstate transportation regulations. If the Company experiences transportation problems, or if there are significant changes in the cost of these services, the Company may not be able to arrange efficient alternatives and timely means to obtain raw materials or ship finished product, which could result in an adverse effect on Company revenues, costs and operating results. Customer product reformulations or new technologies can reduce the demand for the Company’s products. The Company’s products are used in a broad range of customer product applications. Customer product reformulations or development and use of new technologies may lead to reduced consumption of Company-produced products or make some Company products obsolete. It is imperative that the Company develops new products to replace the sales of products that mature and decline in use. The Company’s business, financial position, results of operations and cash flows could be materially and adversely affected if the Company is unable to manage successfully the maturation of existing products and the introduction of new products. To the extent the Company seeks acquisition opportunities, it may not be able to make acquisitions of suitable candidates or integrate acquisitions successfully. To the extent the Company seeks acquisition opportunities to expand into new markets and to enhance its position in existing markets throughout the world, it may not be able to successfully identify suitable candidates, negotiate appropriate acquisition terms, obtain financing needed to consummate those acquisitions, complete proposed acquisitions or successfully integrate acquired businesses into its existing operations. In addition, any acquisition, once successfully integrated, may not perform as planned, be accretive to earnings, or otherwise prove beneficial to the Company. Acquisitions involve numerous risks, including the assumption of undisclosed or unindemnified liabilities, difficulties in the assimilation of the operations, technologies, services and products of the acquired companies and the diversion of management’s attention from other business concerns. In addition, prior acquisitions have resulted, and future acquisitions could result, in the incurrence of substantial additional indebtedness and other expenses. If the Company is unable to keep and protect its intellectual property rights, the Company’s ability to compete may be negatively impacted. portfolio, or where intellectual property rights are more difficult to obtain and/or assert. In addition, the Company may be the target of aggressive and opportunistic enforcement of patents by third parties, including non-practicing entities. Regardless of the merit of such claims, responding to infringement claims can be expensive and time-consuming. If the Company is found to infringe any third-party rights, it could be required to pay substantial damages or it could be enjoined from offering some of its products and services. Also, there can be no assurances that the Company will be able to obtain or renew from third parties the licenses it may need in the future, and there is no assurance that such licenses can be obtained on reasonable terms. The Company’s results of operations may be adversely affected by international business risks, including fluctuations in currency exchange rates, legal restrictions and taxes. enforceability and compliance with U.S. and foreign laws affecting operations outside of the U.S., including the Foreign Corrupt Practices Act (and foreign equivalents), export controls and regulations administered by the Office of Foreign Assets Control. The actual occurrence of any or all of the foregoing could have a material adverse effect on the Company’s business, financial position, results of operations and cash flows in the future. Fluctuations in foreign currency exchange rates could affect Company financial results. The Company is also exposed to fluctuations in exchange rates. The Company’s results of operations are reported in U.S. dollars. However, outside the U.S., the Company’s sales and costs are denominated in a variety of currencies including the European euro, British pound, Canadian dollar, Mexican peso, Colombian peso, Philippine peso, Brazilian real, Polish zloty, Singapore dollar and Chinese RMB. The Company translates its local currency financial results into U.S. dollars based on average exchange rates prevailing during the reporting period or the exchange rate at the end of that period. During times of a strengthening U.S. dollar, the Company’s reported international sales and earnings may be reduced because the local currency may translate into fewer U.S. dollars. Fluctuations in exchange rates may materially and adversely affect the Company’s business, financial position, results of operations and cash flows. In all jurisdictions in which the Company operates, the Company is also subject to laws and regulations that govern foreign investment, foreign trade and currency exchange transactions. These laws and regulations may limit the Company’s ability to repatriate cash as dividends or otherwise to the U.S. or to efficiently allocate cash to support strategic initiatives, and may limit the Company’s ability to convert foreign currency cash flows into U.S. dollars. A weakening of the currencies in which the Company generates sales relative to the foreign currencies in which the Company’s costs are denominated may lower the Company’s operating profits and cash flows. The international scope of the Company’s operations and corporate structure may expose the Company to potentially adverse tax consequences. The Company is subject to taxation in and to the tax laws and regulations of multiple jurisdictions as a result of the international scope of its operations and corporate structure. The Company is also subject to intercompany pricing laws, including those relating to the flow of funds between its entities pursuant to, for example, purchase agreements, licensing agreements or other arrangements. Adverse developments in these laws or regulations, or any change in position regarding the application, administration or interpretation of these laws or regulations in any applicable jurisdiction could have a material adverse effect on the Company’s business, financial position, results of operations and cash flows. In addition, the tax authorities in any applicable jurisdiction may disagree with the positions the Company has taken or intends to take regarding the tax treatment or characterization of any of the Company’s transactions, including the tax treatment or characterization of the Company’s indebtedness. If any applicable tax authorities were to successfully challenge the tax treatment or characterization of any of the Company’s transactions, it could result in the disallowance of deductions, the imposition of withholding taxes on internal deemed transfers or other consequences that could have a material adverse effect on the Company’s business, financial position, results of operations and cash flows. The Company’s failure to comply with the anti-corruption laws of the United States and various international jurisdictions could negatively impact its reputation and results of operations. Doing business on a worldwide basis requires the Company to comply with anti-corruption laws and regulations imposed by governments around the world with jurisdiction over our operations, which may include the U.S. Foreign Corrupt Practices Act (“FCPA”) and the U.K. Bribery Act 2010 (the “Bribery Act”), as well as the laws of the countries where the Company does business. These laws and regulations can apply to companies, individual directors, officers, employees and agents, and may restrict the Company’s operations, trade practices, investment decisions and partnering activities. Where they apply, the FCPA and the Bribery Act prohibit, among other things, the Company and its officers, directors, employees and business partners, including joint venture partners and agents acting on the Company’s behalf, from corruptly offering, promising, authorizing or providing anything of value to “foreign officials” for the purposes of influencing official decisions or obtaining or retaining business or otherwise obtaining favorable treatment. The Bribery Act also prohibits non-governmental “commercial” bribery and accepting bribes. Part of the Company’s business may involve dealings with governments and state-owned business enterprises, the employees and representatives of which may be considered “foreign officials” for purposes of the FCPA and the Bribery Act. The Company is also subject to the jurisdiction of various governments and regulatory agencies around the world, which may bring Company personnel and agents into contact with “foreign officials” responsible for issuing or renewing permits, licenses, or approvals or for enforcing other governmental regulations. The Company’s global operations expose it to the risk of violating, or being accused of violating, anti-corruption laws. Any failure on the part of the Company to successfully comply with these laws and regulations may expose the Company to reputational harm as well as significant sanctions, including criminal fines, imprisonment, civil penalties, disgorgement of profits, injunctions and debarment from government contracts, as well as other remedial measures. Investigations of alleged violations can be expensive and disruptive. The Company maintains policies and procedures designed to assist the Company and its subsidiaries in complying with applicable anti-corruption laws. However, there can be no guarantee that these policies and procedures will effectively prevent violations by Company employees or representatives for which the Company may be held responsible, and any such violation could adversely affect the Company’s reputation, business, financial position and results of operations. The Company is subject to a variety of environmental, health and safety and product registration laws that expose it to potential financial liability and increased operating costs. contamination is discovered, the Company may become subject to additional requirements with respect to existing contamination or the Company’s clean-up obligations. The transportation of certain raw materials is highly regulated and is subject to increased regulation or restrictions, which may restrict or prohibit transport of these raw materials, resulting in these raw materials not being available to the Company in quantities desired by the Company or at costs attractive to the Company, which may restrict or substantially limit the Company’s manufacturing operations. The Company is also subject to numerous federal, state, local and foreign laws that regulate the manufacture, storage, distribution and labeling of many of the Company’s products, including some of the Company’s disinfecting, sanitizing and antimicrobial products. Some of these laws require the Company to have operating permits for the Company’s production facilities, warehouse facilities and operations. Various federal, state, local and foreign laws and regulations also require the Company to register the Company’s products and to comply with specified requirements with respect to those products. If the Company fails to comply with any of these laws and regulations, it may be liable for damages and the costs of remedial actions in excess of the Company’s recorded liabilities, and may also be subject to fines, injunctions or criminal sanctions or to revocation, non-renewal or modification of the Company’s operating permits and revocation of the Company’s product registrations. Any such revocation, modification or non-renewal may require the Company to cease or limit the manufacture and sale of its products at one or more of the Company’s facilities, which may limit or prevent the Company’s ability to meet product demand or build new facilities and may have a material adverse effect on the Company’s business, financial position, results of operations and cash flows. Any such revocation, non-renewal or modification may also result in an event of default under the indenture for the Company’s notes or under the Company’s credit facilities, which, if not cured or waived, may result in the acceleration of all the Company’s indebtedness. In addition to the costs of complying with environmental, health and safety requirements, the Company has incurred and may incur in the future costs defending against environmental litigation and/or investigations brought by government agencies and private parties. The Company is, and may be in the future, a defendant in lawsuits brought by parties alleging environmental damage, personal injury or property damage. A significant judgment or settlement, to the extent not covered by existing insurance policies, against the Company could have a material adverse effect on its business, financial position, results of operations and cash flows. Although the Company has insurance that may cover some of these potential losses, there is always uncertainty as to whether such insurance may be available to the Company based on case-specific factors and the specific provisions of the Company’s insurance policies. The potential cost to the Company relating to environmental, health and safety and product registration matters, including the cost of complying with the foregoing legislation and remediating contamination, is uncertain due to factors such as the unknown magnitude and type of possible contamination and clean-up costs, the complexity and evolving nature of laws and regulations relating to the environment, health and safety and product registration, including those outside of the U.S., and the timing, variable costs and effectiveness of clean-up and compliance methods. Environmental and product registration laws may also become more stringent over time, imposing greater compliance costs and increasing risks and penalties associated with any violation, as well as restricting or prohibiting the sale of existing or new products, which may also negatively impact the Company’s operating results. Without limiting the foregoing, these laws or regulations may restrict or prohibit the use of non-renewable or carbon-based substances, or impose fees or penalties for the use of these substances. Accordingly, the Company may become subject to additional liabilities and increased operating costs in the future under these laws and regulations. The impact of any such changes, which are unknown at this time, may have a material adverse effect on the Company’s business, financial position, results of operations and cash flows. The Company’s inability to accurately estimate and maintain appropriate levels of recorded liabilities for existing and future contingencies may materially and adversely affect the Company’s business, financial position, results of operations and cash flows. The liabilities recorded by the Company for pending and threatened legal proceedings are estimates based on various assumptions. An adverse ruling or external forces, such as changes in the rate of inflation, the regulatory environment and other factors that could prove such assumptions to be no longer appropriate, may affect the accuracy of these estimates. Given the uncertainties inherent in such estimates, the Company’s actual liabilities could differ significantly from the estimated amounts the Company records in its financial statements with respect to existing and future contingencies. If the Company’s actual liability is higher than estimated or any new legal proceeding is initiated or other contingency occurs, it could materially and adversely affect the Company’s business, financial position, results of operations and cash flows. The Company has a significant amount of indebtedness and may incur additional indebtedness, or need to refinance existing indebtedness, in the future, which may adversely affect the Company’s business, financial position, results of operations and cash flows. The Company has a significant amount of indebtedness and may incur additional indebtedness in the future. As of December 31, 2016, the Company had $317.0 million of debt on its balance sheet. U.S. debt included $309.6 million in unsecured promissory notes with maturities extending from 2017 until 2027. The Company’s foreign subsidiaries also maintain bank term loans and short-term bank lines of credit in their respective countries to meet working capital requirements as well as to fund capital expenditure programs and acquisitions. As of December 31, 2016, the Company’s foreign subsidiaries’ aggregate outstanding debt totaled $7.4 million. place the Company at a competitive disadvantage compared to its competitors that have less debt. The Company’s loan agreements contain provisions, which, among others, require maintenance of certain financial ratios and place limitations on additional debt, investments and payment of dividends. Failure to comply with these loan agreements would require debt restructuring that could be materially adverse to the Company’s financial position, results of operations and cash flows. An increase in interest rates could limit the ability of the Company to incur additional debt to fund the Company’s strategic plans or to refinance maturing debt without incurring significant additional cost, and could make borrowings under the Company’s credit facility or other floating rate debt materially more expensive. Additionally, any future disruptions in the credit and financial markets may reduce the availability of debt financing or refinancing and increase the costs associated with such financing. If the Company is unable to secure financing on satisfactory terms, or at all, its business financial position, results of operations and cash flows may be materially and adversely affected. The Company could be adversely affected by downgrades to its credit ratings or disruptions in its ability to access well-functioning capital markets. Historically, the Company has relied on the debt capital markets to fund portions of its capital investments and access to bank credit facilities as part of its working capital management strategy. The Company’s continued access to these markets, and the terms of such access, depend on multiple factors including the condition of debt capital markets, the Company’s operating performance, and its credit ratings. These ratings are based on a number of factors, which include rating agencies’ assessment of the Company’s financial strength and financial policies. There can be no assurance that any particular rating assigned to the Company will remain in effect for any given period of time or that a rating will not be changed or withdrawn by a rating agency, if in that rating agency’s judgment, future circumstances relating to the basis of the rating so warrant. Incurrence of additional debt by the Company could adversely affect its credit ratings. The Company depends on banks and other financial institutions to provide credit to its business and perform under the Company’s agreements with them. Defaults by one or more of these counterparties on their obligations to the Company could materially and adversely affect it. Any downgrade of the Company’s credit ratings could materially adversely affect its cost of funds, liquidity, competitive position and access to capital markets and increase the cost of and counterparty risks associated with existing facilities, which could materially and adversely affect Company business operations, financial condition, and results of operations. markets pose a risk to the overall economy that may impact consumer and customer demand of some of the Company’s products, as well as the Company’s ability to manage normal commercial relationships with its customers, suppliers and creditors. Some of the Company’s customers may not be able to meet the terms of sale and suppliers may not be able to fully perform their contractual obligations due to tighter credit markets or a general slowdown in economic activity. In the event that economic conditions worsen or result in a prolonged downturn or recession, the Company’s business, financial position, results of operations and cash flows may be materially and adversely affected. Conflicts, military actions, terrorist attacks and general instability, particularly in certain energy-producing nations, along with increased security regulations related to our industry, could adversely affect the Company’s business. Conflicts, military actions and terrorist attacks have precipitated economic instability and turmoil in financial markets. Instability and turmoil, particularly in energy-producing nations, may result in raw material cost increases. The uncertainty and economic disruption resulting from hostilities, military action or acts of terrorism may impact any or all of the Company’s facilities and operations or those of its suppliers or customers. Accordingly, any conflict, military action or terrorist attack that impacts the Company or any of its suppliers or customers, could have a material adverse effect on the Company’s business, results of operations, financial position, results of operations and cash flows. Cost overruns, delays and miscalculations in capacity needs with respect to the Company’s expansion or other capital projects could adversely affect the Company’s business, financial position, results of operations and cash flows. From time to time, the Company initiates expansion and other significant capital projects. Projects of this type are subject to risks of delay or cost overruns inherent in any large construction project resulting from numerous factors, including the following: shortages of equipment, materials or skilled labor; work stoppages; unscheduled delays in the delivery of ordered materials and equipment; unanticipated cost increases; difficulties in obtaining necessary permits or in meeting permit conditions; difficulties in meeting regulatory requirements or obtaining regulatory approvals; availability of suppliers to certify equipment for existing and enhanced regulations; design and engineering problems; and failure or delay of third party service providers, civil unrest and labor disputes. Significant cost overruns or delays in completing a project could have a material adverse effect on the Company’s return on investment, results of operations and cash flows. In addition, if the Company misjudges its future capacity needs, this too could negatively impact its operations, financial condition and results of operations. The Company relies extensively on information technology (IT) systems to conduct its business. Interruption of, damage to or compromise of the Company’s IT systems and failure to maintain the integrity of customer, colleague or Company data could harm the Company’s reputation and have an adverse effect on the Company’s business, financial position, results of operations and cash flows. The Company relies on IT systems for most areas of operations, including production, supply chain, research and development, finance, human resource and regulatory functions. The Company’s ability to effectively manage its business depends on the security, reliability and adequacy of these systems. IT system failures due to events including but not limited to network disruptions, programming errors, computer viruses and security breaches (e.g., cyber-attacks) could impact production activities, impede shipment of products, cause delays or cancellations of customer orders, or hamper the processing of transactions or reporting of financial results. These or similar occurrences, whether accidental or intentional, could result in theft, unauthorized use or publication of our intellectual property and/or confidential business information, which could harm our reputation and competitive position, reduce the value of our investment in research and development and other strategic initiatives, result in a loss of business, as well as remedial and other costs, fines, investigations, enforcement actions or lawsuits or otherwise adversely affect our business. The Company continues to develop and enhance controls and security measures to protect against the risk of theft, loss or fraudulent or unlawful use of customer, colleague or company data, and it maintains an ongoing process to re-evaluate the adequacy of its controls and measures. The Company may also be required to expend additional resources to continue to enhance its information privacy and security measures and/or to investigate and remediate any information security vulnerabilities. The Company maintains what it believes to be adequate and collectible insurance in the event of the theft, loss, fraudulent or unlawful use of customer, colleague or company data, but any such occurrences could result in costs which may not be covered or may be in excess of any available insurance that the Company may have procured. While the Company has a comprehensive program in place for continuously reviewing, maintaining, testing and upgrading its IT systems and security, there can be no assurance that such efforts will prevent breakdowns or breaches in Company systems that could adversely affect the Company’s business, financial position, results of operations and cash flows. Various liability claims could materially and adversely affect the Company’s financial position, operating results and cash flows. The Company may be required to pay for losses or injuries purportedly caused by its products. The Company faces an inherent exposure to various types of claims including general liability, product liability, product recall, toxic tort and environmental (“claims”), among others, if its products, or the end products that are manufactured with the Company’s products, result in property damage, injury or death. In addition, because the Company conducts business in multiple jurisdictions, the Company also faces an inherent exposure to other general claims based on its operations in those jurisdictions and the laws of those jurisdictions, including but not limited to claims arising from its relationship with employees, distributors, agents and customers, and other parties with whom it has a business relationship, directly or indirectly. Many of these claims may be made against the Company even if there is no evidence of a loss from that claim, and these claims may be either made by individual entities, or potentially a group of plaintiffs in a class action. Defending these claims could result in significant legal expenses relating to defense costs and/or damage awards and diversion of management’s time and the Company’s resources. Any claim brought against the Company could materially and adversely affect the Company’s business financial position, results of operations and cash flows. The Company’s success depends on its executive management and other key personnel. The Company’s future success depends to a significant degree on the skills, experience and efforts of its executive management and other key personnel and their ability to provide the Company with uninterrupted leadership and direction. The availability of highly qualified talent is limited, and the competition for talent is robust and the Company may not be able to recruit and retain the personnel it needs if it were to lose an existing member of senior management. The Company’s future success will depend on its ability to have adequate succession plans in place and to attract, retain and develop qualified personnel. A failure to efficiently replace executive management members and other key personnel and to attract, retain and develop new qualified personnel could have an adverse effect on the Company’s business financial position, results of operations and cash flows. The following are the Company’s principal plants and other important physical properties. Unless otherwise noted, the listed properties are owned by the Company. Management believes that the facilities are suitable and adequate for the Company’s current operations. Tebras Tensoativos Do Brasil Ltda. and PBC Industria Quimica Ltda. The Company’s property in Maywood, New Jersey and property formerly owned by the Company adjacent to its current site and other nearby properties (Maywood site) were listed on the National Priorities List in September 1993 pursuant to the provisions of CERCLA because of certain alleged chemical contamination. Pursuant to an Administrative Order on Consent entered into between the U.S. Environmental Protection Agency (USEPA) and the Company for property formerly owned by the Company, and the issuance of an order by USEPA to the Company for property currently owned by the Company, the Company has completed various Remedial Investigation Feasibility Studies (RI/FS), and on September 24, 2014, USEPA issued its Record of Decision (ROD) for chemically-contaminated soil. USEPA has not yet issued a ROD for chemically-contaminated groundwater for the Maywood site. Based on the most current information available, the Company believes its recorded liability represents its best estimate of the cost of remediation for the Maywood site. The best estimate of the cost of remediation for the Maywood site could change as the Company continues to hold discussions with USEPA, as the design of the remedial action progresses, if a groundwater ROD is issued or if other PRPs are identified. The ultimate amount for which the Company is liable could differ from the Company’s current recorded liability. In April 2015, the Company entered into an Administrative Settlement Agreement and Administrative Order on Consent with USEPA which requires payment of certain costs and performance of certain investigative and design work for chemically-contaminated soil. Based on the Company’s review and analysis of this order, no changes to the Company’s current recorded liability for claims associated with soil remediation of chemical contamination were required. In addition, under the terms of a settlement agreement reached on November 12, 2004, the United States Department of Justice and the Company agreed to fulfill the terms of a Cooperative Agreement reached in 1985 under which the United States will take title to and responsibility for radioactive waste removal at the Maywood site, including past and future remediation costs incurred by the United States. As such, the Company recorded no liability related to this settlement agreement. During the mid-1970’s, Jerome Lightman and the Lightman Drum Company disposed of hazardous substances at several sites in New Jersey. The Company was named as a PRP in a lawsuit in the U.S. District Court for the District of New Jersey that involved the D’Imperio Property Site located in New Jersey. In 2016, the PRPs were provided with updated remediation cost estimates which were considered in the Company’s determination of its range of estimated possible losses and liability balance. The changes in range of possible losses and liability balance were immaterial. Remediation work is continuing at this site. Based on current information, the Company believes that its recorded liability represents its best estimate of the cost of remediation for the D’Imperio site. Depending on the ultimate cost of the remediation at this site, the amount for which the Company is liable could differ from the current estimates. The Company is currently contractually obligated to contribute to the response costs associated with the Company’s formerly-owned site at 51 Eames Street, Wilmington, Massachusetts. Remediation at this site is being managed by its current owner, to whom the Company sold the property in 1980. Under the agreement, once total site remediation costs exceed certain levels, the Company is obligated to contribute up to five percent of future response costs associated with this site with no limitation on the ultimate amount of contributions. The Company had paid the current owner $2.5 million for the Company’s portion of environmental response costs through December 31, 2016. The Company has recorded a liability for its portion of the estimated remediation costs for the site. Depending on the ultimate cost of the remediation at this site, the amount for which the Company is liable could differ from the current estimates. has denied any liability for any such claims, the Company agreed to this waiver while the parties continue to discuss the resolution of any potential claim which may be filed. The Company believes that based on current information it has adequate reserves for the claims related to this site. However, depending on the ultimate cost of the remediation at this site, the amount for which the Company is liable could differ from the current estimates. The Company has been named as a de minimis PRP at other sites, and as such the Company believes that a resolution of its liability will not have a material impact on the financial position, results of operations or cash flows of the Company. The Company’s common stock is listed and traded on the New York Stock Exchange. As of the close of trading on January 31, 2017, the market price for the Company’s common stock was $78.11. See the table below for New York Stock Exchange quarterly market price information. On February 19, 2013, the Board of Directors of Stepan Company authorized the Company to repurchase up to 1,000,000 shares of its outstanding common stock. During 2016, 43,835 shares of Company common stock were purchased in the open market. These shares were recorded as treasury stock in the Company’s balance sheet. At December 31, 2016, 717,929 shares remained available for repurchase under the February 19, 2013, authorization. The timing and amount of the repurchases are determined by the Company’s management based on its evaluation of market conditions and share price. Shares will be repurchased with cash in open market or private transactions in accordance with applicable securities and stock exchange rules. On January 31, 2017, there were 1,649 holders of record of common stock of the Company. There were no purchases of shares of the Company’s stock by the Company during the fourth quarter of 2016. See the table below for quarterly dividend information. The Company has increased its dividends for 49 consecutive years. The Company has material debt agreements that restrict the payment of dividends. See the Liquidity and Financial Condition section of Part II, Item 7, Management’s Discussion and Analysis, for a description of the restrictions. See also Note 6, Debt, of the consolidated financial statements (Item 8 of this Form 10-K) for the amount of retained earnings available for dividend distribution at December 31, 2016. The following stock performance graph compares the yearly change since December 31, 2011, in cumulative return on the common stock of the Company on a dividend reinvested basis to the Dow Jones Chemical Industry Index and the Russell 2000 Index. 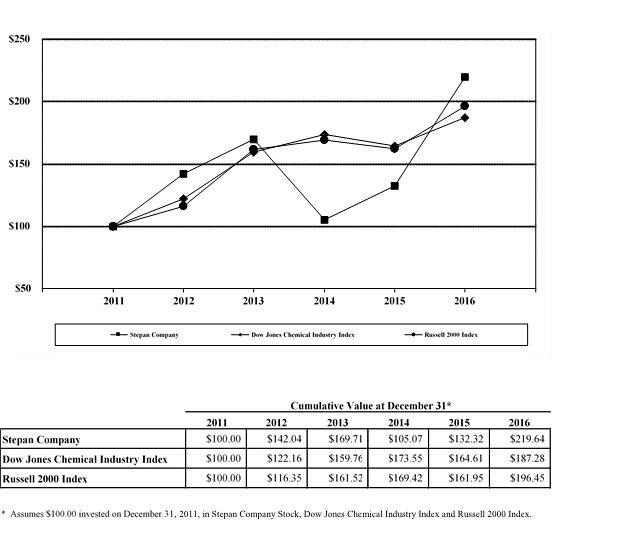 The Dow Jones Chemical Industry Index is a market-capitalization weighted grouping of 35 chemical companies, including major manufacturers of both basic and specialty products. The Company is not included in the Dow Jones Chemical Industry Index. The Russell 2000 Index is a market-capitalization weighted grouping of 2,000 small to medium sized companies in a broad range of industries. The Company has been included in the Russell 2000 Index since 1992. The graph assumes $100 was invested on December 31, 2011, and shows the cumulative total return as of each December 31 thereafter. The 2016 amounts for the noted items lack comparability with the prior years due to the Company’s early adoption of the new accounting guidance regarding stock-based compensation. See Note 1 to the consolidated financial statements (Item 8 of this Form 10-K) for additional information regarding Accounting Standards Update No. 2016-9. Amounts for 2012 through 2015 have been changed from those originally reported as a result of the Company’s January 1, 2016, adoption of the new accounting guidance regarding the classification of debt issuance costs. See Note 1 to the consolidated financial statements (Item 8 of this Form 10-K) for additional information regarding Accounting Standards Update No. 2015-3. The following is management’s discussion and analysis (MD&A) of certain significant factors that have affected the Company’s financial condition and results of operations during the annual periods included in the accompanying consolidated financial statements. Surfactants – Surfactants, which accounted for 67 percent of Company consolidated net sales in 2016, are principal ingredients in consumer and industrial cleaning products such as detergents for washing clothes, dishes, carpets, floors and walls, as well as shampoos and body washes. Other applications include fabric softeners, germicidal quaternary compounds, lubricating ingredients, emulsifiers for spreading agricultural products and industrial applications such as latex systems, plastics and composites. Surfactants are manufactured at five North American sites, three European sites (United Kingdom, France and Germany), five Latin American sites (Mexico, Colombia and three sites in Brazil) and two Asian sites (Philippines and Singapore). In 2016, the Company shut down its production facility in Canada, moving the production of goods previously manufactured in Canada to other Company North American production sites. Manufacturing operations at that facility have ceased, but decommissioning activities will continue into 2017. In October 2016, the Company’s subsidiary in Brazil closed on its previously announced agreement to acquire the commercial business of Tebras Tensoativos do Brazil Ltda. and the sulfonation production facility of PBC Industria Quimica Ltda. See Business Acquisition section below. In late 2016, a major customer of the Company’s Bahia, Brazil, plant exited the product line for which the Company was supplying them product. As a result, asset impairments were required (see Note 22 to the consolidated financial statements for additional information). Prior to 2016, the Company also held a 50 percent ownership interest in a joint venture, TIORCO, LLC (TIORCO), that marketed chemical solutions for enhanced oil recovery (EOR). The joint venture was accounted for under the equity method, and its financial results were excluded from surfactant segment operating results. In October 2015, the Company and its partner, Nalco Company (a subsidiary of Ecolab Inc.), made the decision to dissolve TIORCO. No business activities have been conducted since the fourth quarter of 2015. Legal dissolution of TIORCO is finalized. Polymers – Polymers, which accounted for 28 percent of consolidated net sales in 2016, include polyurethane polyols, polyester resins and phthalic anhydride. Polyurethane polyols are used in the manufacture of rigid foam for thermal insulation in the construction industry and are also a base raw material for coatings, adhesives, sealants and elastomers (collectively, CASE products) and flexible foams. Polyester resins, which include liquid and powdered products, are used in CASE and polyurethane systems house applications. CASE, polyester resins and flexible foam are collectively referred to as specialty polyols. Phthalic anhydride is used in unsaturated polyester resins, alkyd resins and plasticizers for applications in construction materials and components of automotive, boating and other consumer products. In addition, the Company uses phthalic anhydride internally in the production of polyols. In the United States, polyurethane polyols and phthalic anhydride are manufactured at the Company’s Millsdale, Illinois, site and specialty polyols are manufactured at the Company’s Columbus, Georgia, site. In Europe, polyurethane polyols are manufactured at the Company’s subsidiary in Germany, and specialty polyols are manufactured at the Company’s Poland subsidiary. In China, polyurethane polyols and specialty polyols are manufactured at the Company’s Nanjing, China, manufacturing plant that was commissioned in early 2016. Specialty Products – Specialty Products, which accounted for five percent of consolidated net sales in 2016, include flavors, emulsifiers and solubilizers used in food, flavoring, nutritional supplement and pharmaceutical applications. Specialty products are primarily manufactured at the Company’s Maywood, New Jersey, site and, in some instances, at outside contractors. On October 3, 2016, the Company’s subsidiary in Brazil acquired the commercial business of Tebras Tensoativos do Brazil Ltda. (Tebras) and the sulfonation production facility of PBC Industria Quimica Ltda. (PBC). The purchase price of the acquisitions, including adjustments for working capital, was approximately $29.1 million. The combined entities have 25,000 metric tons of sulfonation capacity and a large, diverse customer portfolio. The acquisition is expected to expand and diversify the Company’s customer base for sulfonated products in Brazil and to provide an opportunity to sell the Company’s broader surfactant portfolio to over 1,200 new customers who could benefit from the Company’s technical service and formulation support. The acquired businesses are included in the Company’s Surfactants segment. The acquired entities’ contributions to Company net sales and net income for the year ended December 31, 2016, were insignificant. See Note 20 to the consolidated financial statements for further information regarding the business acquisition. See the applicable Corporate Expenses section of this MD&A for details regarding the period-to-period changes in deferred compensation. Net income attributable to the Company for 2016 increased 13 percent to $86.2 million, or $3.73 per diluted share, from $76.0 million, or $3.32 per diluted share, for 2015. Adjusted net income increased 24 percent to $98.2 million, or $4.25 per diluted share, from $79.4 million, or $3.46 per diluted share (See the “Reconciliations of Non-GAAP Adjusted Net Income and Diluted Earnings per Share” section of this MD&A for reconciliations between reported net income attributable to the Company and reported earnings per diluted share and non-GAAP adjusted net income and adjusted earnings per diluted share). Below is a summary discussion of the major factors leading to the year-over-year changes in net sales, profits and expenses. A detailed discussion of segment operating performance for 2016 compared to 2015 follows the summary. Consolidated net sales declined $10.0 million, or one percent, between years. Sales volume increased six percent, which had a $114.0 million favorable effect on the year-over-year change in net sales. All three reportable segments contributed to the consolidated sales volume improvement. By segment, sales volume increased five percent, 12 percent and eight percent for Surfactants, Polymers and Specialty Products, respectively. The effect of increased consolidated sales volume was more than offset by lower selling prices and the unfavorable effects of foreign currency translation, which negatively affected the year-over-year net sales change by $81.1 million and $42.9 million, respectively. The decreased selling prices were primarily attributable to declines in raw material costs. Overall unit margins improved slightly between years. The unfavorable foreign currency translation effect reflected a stronger U.S. dollar against all currencies for countries where the Company has foreign operations. Operating income for 2016 improved $3.4 million, or three percent, over operating income for 2015 despite current year restructuring and asset impairment charges of $7.1 million and increased deferred compensation expense of $10.3 million. Operating income improved for Polymers and Specialty Products. Surfactant segment operating income declined four percent largely due to the settlement of two customer claims and accelerated depreciation related to the cessation of manufacturing operations at the Company’s Canadian plant. Last year’s operating income included a $2.9 million gain on the sale of the Company’s specialty polyurethane systems product line. Foreign currency translation had an unfavorable $3.7 million effect on the year-over-year consolidated operating income change. Selling expenses increased $1.7 million, or three percent, year over year largely due to higher U.S. fringe benefit expenses ($1.0 million), which reflected increased incentive-based compensation (which includes stock-based compensation, bonuses and profit sharing) recognized as a result of the year-over-year improvement in Company financial performance and in Company common stock value. Administrative expenses declined $0.9 million, or one percent, year over year. The decrease was attributable to lower consulting expense ($5.2 million) as external resources related to the initiative to improve efficiency across the Company’s global organization (referred to as DRIVE) were not used in 2016. Partially offsetting the lower consulting expense were higher fringe benefit ($2.3 million) and salary ($1.2 million) expenses. Higher U.S. incentive-based compensation led to the increase in fringe benefit expense. Legal and environmental expense also increased by $0.9 million primarily due to adjustments to Company environmental liabilities. Research, development and technical service (R&D) expenses increased $5.8 million, or 12 percent, year over year. Higher expense for U.S. salaries and the related fringe benefits ($3.9 million) was the major contributor to the increase. In addition, foreign R&D expenses grew $0.4 million, as some of the Company’s non-U.S. subsidiaries have added product development resources to support their local needs. The accumulation of increases for a number of other expense items accounted for the remainder of the year-over-year variance. Deferred compensation plan expense was $10.3 million higher in 2016 than in 2015 due to a significantly larger increase in the value of Company common stock during 2016 than for 2015. See the “Overview” and “Corporate Expenses” sections of this MD&A for further details. Business restructuring and asset impairment charges totaled $7.1 million in 2016. There were no such charges in 2015. Restructuring expenses related to the closure of the Company’s surfactant plant in Canada amounted to $2.8 million. In addition, the Company recognized impairment charges of $4.3 million. See Note 22 to the consolidated financial statements for additional information. The business restructuring and asset impairment charges were excluded from the determination of segment operating income. Net interest expense for 2016 declined $1.3 million, or nine percent, from net interest expense for 2015. The decline in interest expense was principally attributable to higher interest income earned on excess cash. Lower average debt levels due to scheduled repayments also contributed. In the fourth quarter of 2015, the Company and its partner agreed to dissolve the TIORCO joint venture and, therefore, the Company has reported no results in the loss from equity joint venture line in 2016. The Company’s share of TIORCO’s loss for the 2015 was $7.0 million. Other, net income for 2016 declined $0.8 million, or 48 percent, from other, net income for 2015. Foreign exchange activity resulted in an insignificant loss in 2016 compared to a $0.7 million gain in 2015. Investment income (including realized and unrealized gains and losses) for the Company’s deferred compensation and supplemental defined contribution mutual fund assets declined $0.1 million between years to $0.8 million in 2016 from $0.9 million in 2015. The effective tax rate was 24.3 percent in 2016 compared to 26.1 percent in 2015. The decrease was attributable to the following items: 1) a tax benefit derived from the early adoption of Accounting Standards Update No. 2016-9, Compensation – Stock Compensation (Topic 718): Improvement to Employee Share-Based Payment Accounting (see Recent Accounting Pronouncements in Note1 to the consolidated financial statements); 2) an unrecognized tax benefit recorded in 2015 that was nonrecurring in 2016; and 3) a more favorable geographical mix of income in 2016. This decrease was partially offset by the 2011 and 2012 Agricultural Chemicals Security Credit tax benefit recorded in 2015 that was nonrecurring in 2016. See Note 9 to the consolidated financial statements for a reconciliation of the statutory U.S. federal income tax rate to the effective tax rate. Net sales for North American operations declined two percent between years. Sales volume increased seven percent, which favorably affected the year-over-year change in net sales by $49.7 million. The effect of the increased sales volume was more than offset by an eight percent decline in selling prices and the unfavorable impact of foreign currency translation, which negatively affected the change in net sales by $61.1 million and $1.7 million, respectively. Most of the sales volume growth occurred in the first three quarters of 2016. For the full year, laundry and cleaning products were the largest contributors to the sales volume improvement, as the Company derived the full-year benefits of a supply agreement with a large customer that commenced during the third quarter of 2015. Sales volume for products used in personal care applications declined, primarily due to weaker demand in the second half of 2016 coupled with some lost business. In addition, lower crude oil prices led to a decrease in sales volumes of oil field products used in EOR applications. The year-over-year decline in sales prices primarily reflected decreased raw material costs, particularly for the first half of 2016, and a less favorable sales mix. The foreign currency impact reflected a stronger U.S. dollar relative to the Canadian dollar. and $4.6 million, respectively. Selling prices averaged one percent higher, which had a $3.1 million favorable effect on the year-over-year net sales change. A weaker British pound sterling relative to the U.S. dollar accounted for most of the foreign currency effect. The decline in sales volume was mainly attributable to weaker demand for agricultural chemicals, laundry and cleaning products and personal care products. Sales volumes of general surfactants sold through distributors increased year over year. Net sales for Latin American operations increased two percent. Included in fourth quarter and full year 2016 net sales was $4.3 million in compensation for future lost revenue related to a negotiated settlement with a major customer under contract with the region’s Bahia, Brazil, plant that exited the product line for which the Company supplied them product (see Note 22 to the consolidated financial statements for further information). A six percent increase in sales volume and higher selling prices favorably affected the year-over-year change in net sales by $8.7 million and $6.4 million, respectively. The unfavorable effects of currency translation offset the positive impacts of increased sales prices and volumes by $17.0 million. Improved laundry and cleaning and agricultural chemical sales volumes in Brazil accounted for most of the improvement in Latin America. New business related to the fourth quarter 2016 acquisitions of Tebras and PBC also contributed to the growth in sales volumes and net sales dollars. The higher selling prices reflected increased raw material costs and a more favorable mix of sales. The year-over-year weakening of the Brazilian real, Mexican peso and Colombian peso against the U.S. dollar led to the foreign currency translation effect. Net sales for Asian operations increased 13 percent primarily due to a nine percent increase in average selling prices and a seven percent growth in sales volume, which positively affected the year-over-year change in net sales by $6.1 million and $4.4 million, respectively. An improved mix of sales coupled with the effects of increased raw material costs led to the higher average selling prices. Most of the sales volume improvement was attributable to new business and increased demand from existing customers of the Company’s Philippine operations. Sales volume also increased from Singapore. Foreign currency translation had a $2.8 million unfavorable effect on the net sales change. Gross profit for North American operations increased one percent principally as the result of the seven percent year-over-year improvement in sales volume. The favorable effect of the growth in sales volume was largely offset by $4.5 million of accelerated depreciation associated with the shutdown of manufacturing operations at the Company’s Canadian plant. Gross profit for European operations declined 26 percent between years largely due to the aforementioned $7.4 million customer claim settlements and a two percent decline in sales volume. The region also incurred approximately $0.6 million of expenses associated with a planned 30-day mandatory inspection shutdown of the Company’s plant in Germany. There was no such inspection in 2015. Foreign currency translation negatively affected the change in gross profit by $1.0 million. Gross profit for Latin American operations improved twelve percent mainly due to the $4.3 million settlement noted earlier and the effects of the six percent increase in sales volume. Foreign currency translation negatively impacted gross profit by $2.8 million. The contribution from the Tebras and PBC acquisitions was insignificant for 2016. Asia gross profit increased 66 percent largely due to the seven percent increase in sales volume and to margin improvement, particularly for the Company’s Philippine operations. A more favorable product mix, higher selling prices and greater utilization of the plant in the Philippines led to the margin improvement. Operating expenses for the Surfactants segment increased $8.8 million, or 10 percent, year over year. Expenses increased for all regions, reflecting the additional resources and expenditures necessary to support the segment’s global organization and growth initiatives. In addition, U.S. incentive-based compensation (which includes stock-based compensation, bonuses and profit sharing) increased between years due to improved Company financial performance and higher common stock prices. The favorable effects of foreign currency translation reduced the year-over-year change in operating expenses by $1.6 million. Net sales for North American operations increased one percent. Sales volume increased nine percent, which had a $29.7 million favorable effect on the year-over-year net sales change. Selling prices declined eight percent, which offset the impact of higher sales volume by $27.5 million. The sales volume improvement was attributable to a 20 percent increase for polyols used in rigid foam applications. New business and the continued growth in demand for rigid foam insulation led to the polyol sales volume growth. Sales volume of phthalic anhydride and specialty polyols declined three and five percent, respectively, between years. Year-over-year decreases in the cost of raw materials drove the decline in selling prices. Net sales for European operations increased two percent. Sales volume grew 14 percent, which had a $20.8 million favorable effect on the year-over-year net sales change. The sales volume improvement was driven by new business and increased demand for polyols used in rigid foam insulation and insulated metal panels. The impact of higher sales volume was partially offset by the effects of lower selling prices and foreign currency translation, which negatively affected the change in net sales by $10.6 million and $6.9 million, respectively. Lower raw material costs led to the decline in selling prices. Net sales for Asia and Other operations increased eight percent between years due to a 29 percent increase in sales volume, which had a $6.8 million positive impact on the year-over-year net sales change. Business gained from efforts to fill the capacity of the Company’s new plant in Nanjing, China, accounted for most of the sales volume increase. The unfavorable effects of lower selling prices and foreign currency translation negatively impacted the change in net sales by $3.5 million and $1.5 million, respectively.